1976 .The driving force behind the creation of the Folkecenter - initially called "Nordvestjydsk Folkecenter for Vedvarende Energi" was charismatic Preben Maegaard, who was educated as a Civil Economist. In 1976 the first handbook on wind energy was published: "Vindkraftbogen" by the Swede Bengt Södergård. In 1975 the book was published in Sweden. Preben was inspired by the book, and made his first primitive Wind Turbine in 1976. On March 10th 1977 Preben Maegaard and other local people in Thisted founded the organization NIVE ( "Nordvestjydsk Institut for Vedvarende Energi"). In cooperation with a local metal workshop HP Maskinfabrik, NIVE wanted to establish a decentralized production of Wind Turbines. 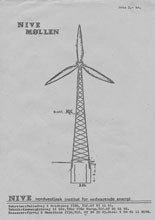 The Bonus turbine did not derive directly from the grassroot scene, like Vestas did, but Danregn Vindkraft clearly was inspired by the NIVE design, and Preben Maegaards ideas. Download a pdf file with the first proposal, by clicking the picture at right: "NIVE MØLLEN". In February 1978 the first course on renewable Energy was implemented at Sydthy Lejrskole, organized by The Workers Union of City Ribe. The course was aimed at young unemployed people aged 16 - 24 years. On November 13th 1978 the NIVE-Orientering (INFO) told in paragraph 13, that a 5.5 meter Sail Wing was built at the above course in Winter. Download the NIVE Info here (in Danish). In NIVE, Preben Maegaard gathered 4 people around him, who each wanted to erect Turbines at their homes: Kaj Fjendbo Jørgensen, Bjørn Rossing, Henning Kvejborg and Per Mannstaedt (a movie film director living near Copenhagen). In January 1978 Preben Maegaard called Erik Grove-Nielsen of Økær Vind Energi to order 4 sets of 5 meter long blades. Preben wanted the blades to run at 75 rpm. The 4.5 meter TVIND-design blades that Økær produced at the beginning was spinning at 115 rpm, so he had to design new blades for the order. NIVE developed the so called "Smedemester mølle" (The blacksmith turbine) with the intention to spread out the production of wind turbines to small metal machine shops all around the Danish country. The prototype was built by H. Poulsen at the nearby small town of Lyngs. The son, Bendy Poulsen, was a skilled and innovative metal craftsman. 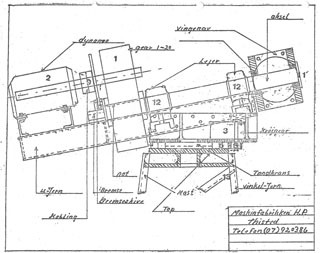 Bendy was central in building the smedemester turbine. 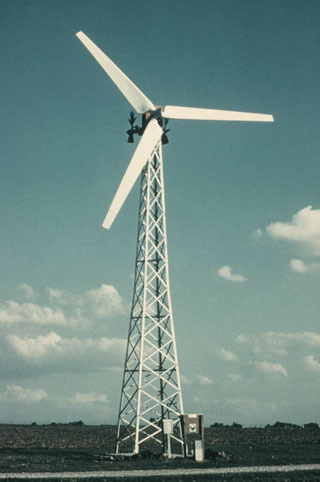 The prototype was put on show at a nearby trade fair in "Sjørslev Hallen" in summer 1979, just before it was installed for development test on the newly inaugurated Test Station for Small Wind Turbines at RISØ, in september 1979. The FolkeCenter was established on July 1st of 1983, with Preben Maegaard as the manager and charismatic headmaster. As this takes place later than the grassroot time frame on this web site ( 1975 - 1979) it is not described here. In 1983 more than 20 commercial firms were manufacturing wind turbines in Denmark, and the politicians had created a subsidy for buyers to get the market rolling. After 1979, the role of the grassroots thus deminished fast.